A stylish snake print adds a fashionable touch to this folio case from Specter. 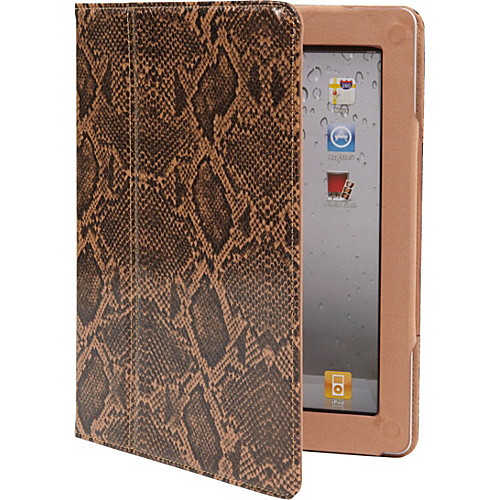 The Specter Magnetic Folio Case Case for iPad 2 & New iPad – Snake Skin Texture is made from synthetic material and features an allover snake print pattern that gives this case a fashion forward look for the stylish woman on the go. This folio case has a slim design with a magnetic clasp closure on the cover and a solid interior frame that holds your iPad safely inside. The cover folds back to create an angled stand for upright typing or viewing while the interior frame offers unrestricted access to all ports and controls.